Another collaborative diagram between myself and partner Jonathan Kane. 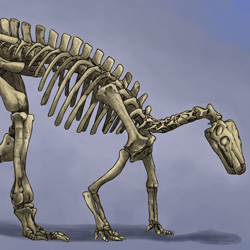 The image relates to an explanation for the reason why theropod dinosaurs appear to have lost their two outermost fingers, but bird embryos form and then lose the inner- and outermost fingers. If birds evolved from dinosaurs, then one would expect that the three "fingers" present in modern birds would have evolved from the three fingers of theropod dinosaurs. However, this is not the case, and this seeming inconsistency has been a common argument of both creationists and BANDits for decades. To understand the effects of a frameshift, it’s helpful to imagine an absent-minded postman who accidentally gives several people the mail that was meant for their neighbors. Just as this causes a person’s mailbox to contain mail that normally would have gone in their neighbor’s mailbox, a frameshift has caused the middle two toes of the two-toed earless skink embryo to develop using the genetic code that normally would have been used by the inner two. This is a documented case in living animals where a frameshift has caused the exact same difference that exists between the hands of birds and theropods, so it is clearly possible the same thing could have happened in birds also. And in fact, there is a way to measure whether it happened or not. If you accidentally receive your neighbor’s mail, you don’t usually need to guess at whether you did. If your neighbor subscribes to a magazine that you don’t, and you see a copy of that magazine in your own mailbox, you can usually figure out what’s happened. What if there were a way to look for the same thing in the hands of bird embryos, and examine whether the genetic code we would normally expect to see used by an embryo’s inner three fingers has ended up in birds’ middle three? Just as receiving your neighbor’s magazine is a sure sign that his mail was delivered to you, perhaps one of the fingers of bird embryos develops using a combination of genes normally reserved for a different finger, which would be a sure sign that a frameshift took place. This is exactly what’s the case. 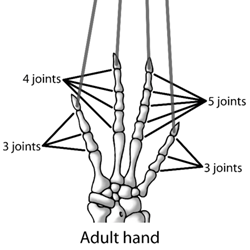 In all animals that have five fingers as adults, the genes Hox13 and Hox12 are both expressed in the development of the outer four fingers, while the innermost finger (the finger which is the thumb on a human) develops using only Hox13 and not Hox12. If you imagine these five fingers as five neighbors, developing with Hox13 and without Hox12 is the equivalent of a magazine that’s delivered only to the innermost finger and none of the others. On bird embryos, the innermost finger does not develop into anything—only the middle three do—so ordinarily one would expect both Hox13 and Hox12 to be expressed in all three of the embryonic fingers which eventually fuse into birds’ hands. However, what we find instead is that the second-innermost finger of bird embryos develops with Hox13 but without Hox12. To put it another way, the magazine normally received by only the embryo’s innermost finger has been delivered to its second-innermost finger. 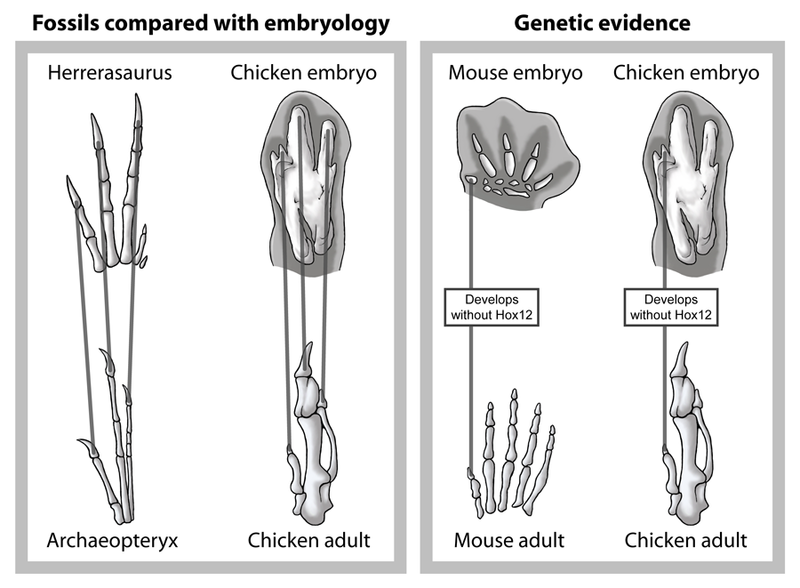 Even if it weren’t for the fossil evidence suggesting the ancestors of birds lost their outer two fingers, this evidence from Hox genes would be enough to show that the three fingers of birds were originally the inner three, but their genetic mail has been delivered to the middle three embryonic fingers instead. Diagram referenced from: Vargas, Alexander O. and John F. Fallon. “The Digits of the Wings of Birds Are 1, 2, and 3. A Review.” Journal of Experimental Zoology 304B (2005): 206–219.